Medical treatment carts are one of the most significant innovations introduced into the field of medicine. These mobile workstations keep medication secure, as well as making information and other technology readily available to hospital staff. They allow staff to quickly access files and view patient histories, as well as dispensing medication, all at the patient’s bedside. Medical personnel can immediately take care of their patients’ needs, improving the quality and speed of care. Here are five ways medical treatment carts can enhance your patient care. Doctors and nurses are always on their feet as they go about their daily rounds. Using medical treatment carts, hospital staff can administer treatment to patients quickly and easily. 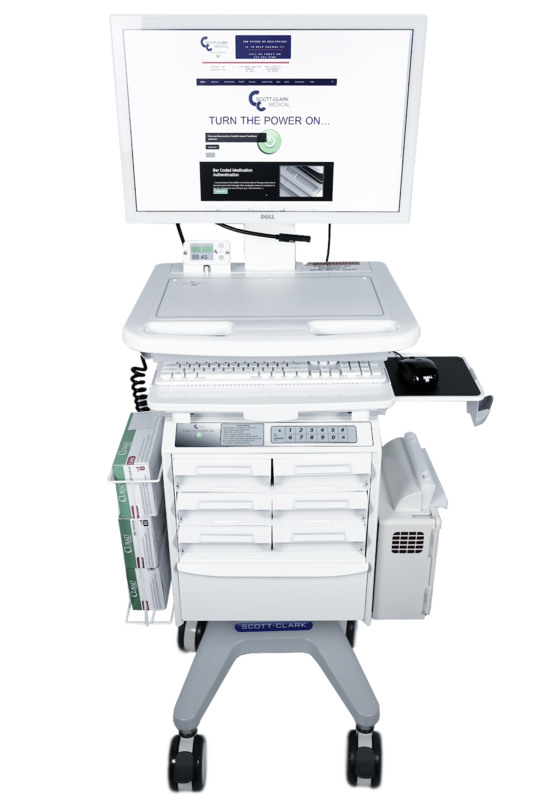 A mobile cart that is lightweight and easy to maneuver can increase the quality of patient care, as well as improving your staff’s comfort and productivity. Our medical treatment carts are made with lightweight aluminum alloy for an up to 75% reduction in weight, and they are height-adjustable. Scott-Clark Medical offers medical treatment carts that users can adapt in a multitude of ways to suit the needs of their medical facility. Your staff can store everything they might need at any given moment in one compact unit. Our carts can also be modified to hold two monitors, a printer, a barcode reader, and more. When treating many patients at a time, staff need a variety of medicine. This helps to reduce delays created by personnel having to travel to and from static medication storage facilities. However, medication also needs to be kept safe and secure during transportation to avoid violating medical regulations. The durable and reliable patented electronic locking mechanisms we use in our medical treatment carts make getting to medication fast and simple while preventing any unauthorized access. Passcode and proximity-activated keycard security systems are available, as well as conventional key-based locks. Mobile medical treatment carts can be used to perform many of the functions your staff will need all in one multipurpose system. Administrative tasks can be completed using an onboard computer; vital signs can be checked and uploaded to a digital patient database from remote locations, and more. Users can customize their medical treatment carts with multiple compartments of different shapes and sizes. These compartments can be used to store and dispose of needles, drips, and other medical equipment safely. Caregivers have no time to waste, and a mobile cart can increase their productivity by a significant margin. Our carts can last for an entire shift and beyond thanks to multiple long-life FMCP batteries that users can easily swap out as needed. Scott-Clark Medical provides a range of medical treatment carts to suit all kinds of healthcare facilities. 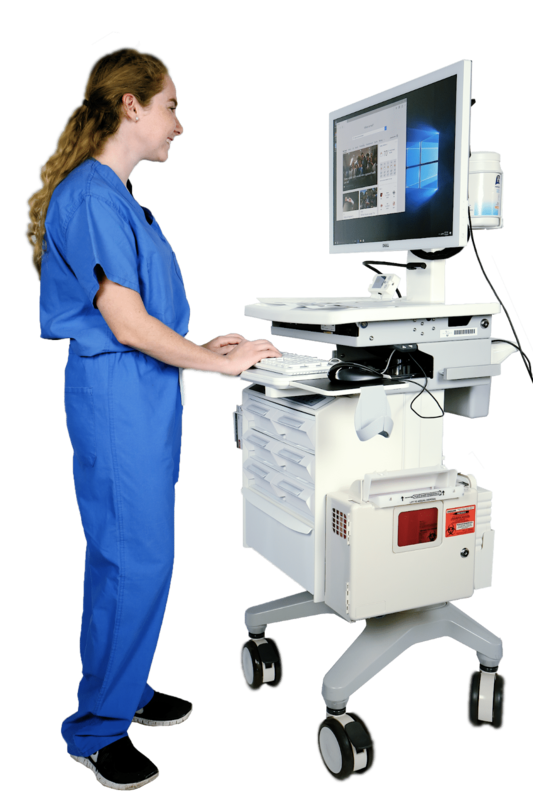 The convenience and comfort of a mobile workstation allow medical professionals to carry out their duties with ease.